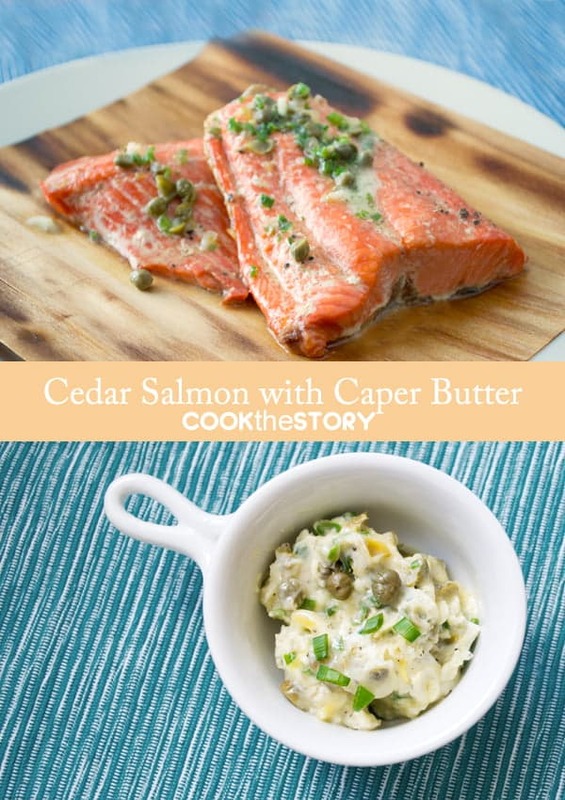 Today I’m sharing a recipe for Cedar Grilled Salmon with Caper Chive Butter. 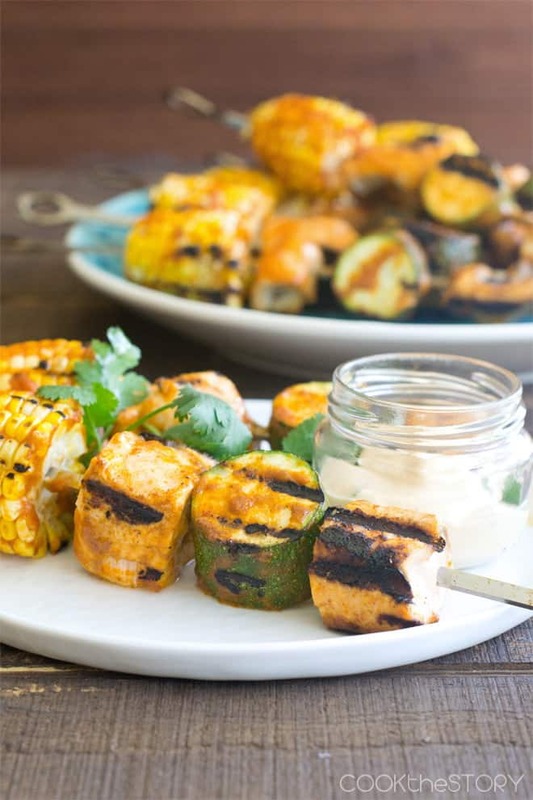 It’s a fresh, easy, flavorful, and healthy dinner recipe. I began blogging without a lot of expectations. I certainly didn’t expect that I’d regularly end up with freshly caught wild Alaskan seafood on my doorstep. Don’t worry! The seafood is shipped from Alaska overnight and arrives accompanied by many ice packs. This summer the salmon sent to me from the Copper River / Prince William Sound Marketing Association has not only been delicious but it has arrived at convenient times. The first batch, some vibrant Copper River Sockeye, arrived while my brother-in-law and his family were visiting from the UK. 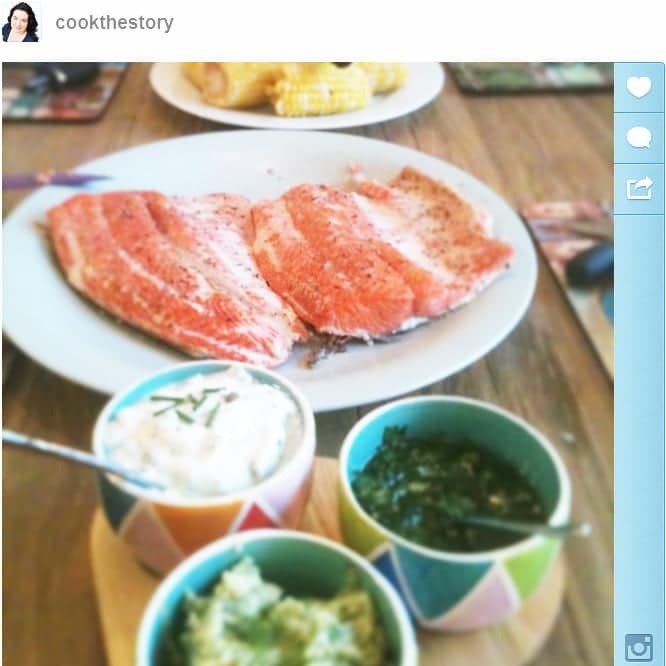 They had never before seen such darkly colored salmon that wasn’t color-enhanced through feed. They read all the literature that came with the salmon to discover that the catch was in fact wild and the color natural. They didn’t need to read anything to find out about the taste! We grilled the salmon on cedar wrappers that night and we all agreed that it was the best we’d ever had. I prepared it very simply, brushing the cedar wrappers lightly with vegetable oil and then topping the salmon with salt and pepper. On the side of the grilled salmon I served a room temperature butter mixture comprised of butter, chopped capers, chives and lemon zest. The slowly-melting butter was like a sauce that added creaminess and a bit of acidity to the rich grilled salmon. The second batch of salmon, this time Sockeye Salmon from Prince William Sound, arrived this weekend, on the very day that we were having some good friends and seafood-lovers over for dinner. I’ll share the instagram photo of our dinner here but you’ll have to wait to find out what I served with the grilled salmon this time. If you love fresh salmon recipes, you should also check out my recipe for salmon tikka masala skewers. Here’s the recipe for the grilled salmon with Caper Chive Butter. This salmon is grilled very simply on a cedar wrapper. The butter is served at room temperature on the side. As everyone puts the butter on their salmon, it will begin to melt slowly adding a mild acidity to the richness of the fish. Place the cedar wrappers in a 13x9" cake pan and top with water. Allow to soak for at least 10 minutes. Brush the cedar wrappers with the vegetable oil. Sprinkle about 1/8 tsp of coarse salt and 1/8 tsp of coarse pepper onto the oil of each wrapper. Top each with a salmon fillet, skin side down. Sprinkle each fillet with another 1/8 tsp of coarse salt and 1/8 tsp of coarse pepper. Transfer the salmon-topped cedar wrappers to the grill. Grill over direct medium heat for 9-14 minutes, or until they have reached your desired doneness. Meanwhile, combine the butter, the 1/4 tsp remaining coarse salt, the chives and the lemon zest. 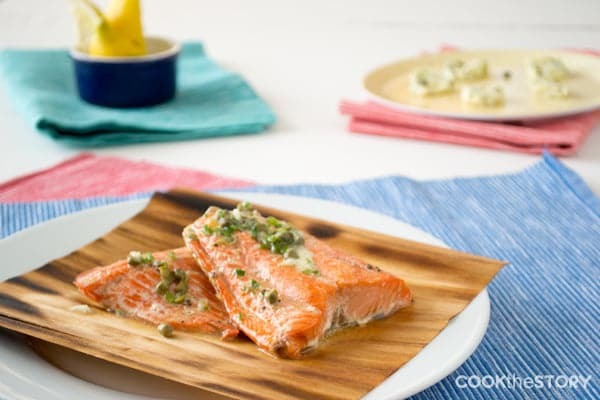 Serve the salmon fillets on the cedar wrappers and top at the table with the caper chive butter. Disclosure: I have not been paid to write this post. I have been given some fresh salmon from the Copper River Salmon Association and cedar planks and wrappers that were used for a giveaway, given by the Copper River Salmon Association and Outdoor Gourmet. All opinions are my own. This recipe sounds so good! Can’t wait to try it! I love grilled salmon with roasted potatoes and a caper cream sauce! I love to serve grilled asparagus and smoked baked potatoes with salmon. This looks absolutely delicious! 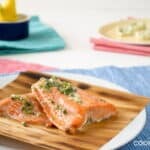 I’ve made salmon with a lemon butter pan sauce, but I’ve never tried a lemon butter like you did here – great idea! I plan on serving it with roasted potatoes or grilled asparagus; I”ll let you know what I end up choosing! During the summer, I’d serve a fresh green salad and fresh fruit. During the winter, I may prefer grilled asparagus. I love salmon. Thanks for the giveaway. I make a delicious cedar grilled salmon with a chili garlic sauce. It’s a little on the spicy side, but oh so delicous! I got the recipe from my resident chef at work, it’s his specialty. Everyone who has ever tried it can’t stop talking about how good it is. This flavor combination sounds wonderful, I can’t wait to try and make this! Me like-ee salmon! Your preparation looks divine! I came across your page looking for summer salmon recipes :) excited to try it out! Melissa, If you try it, let me know. I’d love to hear your thoughts on the recipe. Katie, thank you so much. I also adore capers. I need to find more dishes that make use of them! Okay we fish for salmon here so a new recipe is always welcome! And the ice packs..OMG they are taking over the garage. And you are going to be so jealous when you here this but I got to use ALL my saved ice packs this weekend! Yep. My neighbors had a wedding at home and needed TONS of ice. We froze all the ice packs and blocks and they worked so well. I felt so vindicated for saving them all, LOL! Holy! You must have even more ice packs than I do. I better start making space in my garage for more. Looks and sounds delicious. I really like the juice of a lemon, melted butter and dill.